NuSource, LLC was awarded a significant project to deliver custom hardware for a nuclear power plant located in the southeastern United States. 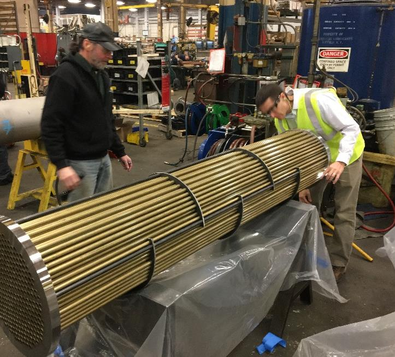 This project will include the design and manufacturing of safety related, ASME Code Section III replacement heat exchanger tube bundles to be installed on the Emergency Diesel Generators at the site. Emergency Diesel Generators (EDGs) are one of the most critical pieces of equipment at all nuclear power plants, acting as the redundant electrical power source for emergency cooling and shut-down equipment. Given their importance to plant safety and increased regulatory scrutiny post-Fukushima, EDG maintenance reliability is a top priority at all plants. The scope of this win demonstrates NuSource’s capability to deliver specialty replacement hardware with an improved design which will solve an ongoing material degradation problem that has challenged the plant over the past several years. With the improved design, NuSource will utilize alternate materials that will be more corrosion resistant, will provide a longer life of the equipment, and will exhibit improved thermal performance of the units. This project will be executed in accordance with the NuSource Quality Assurance Manual via its ASME “N” certificate of authorization and Appendix B nuclear program.